I am getting this message a lot lately. Today I sent notifications of two spam messages appearing on one of the forums and have to WAIT 30 seconds before I could post the 2nd notification. Inconvenienced for trying to help? Thanks, I'll get that fixed. It's still happening! I am reporting SPAM messages on the E60 forum and have to wait! Why not just get rid of the feature altogether? I apologize as I assumed the the delay had been reduced as I had not received any additional reports since October. The purpose is to prevent a spammer from flooding the forum with posts. I'll check on Monday again to see if we can lower it, however, there will always be a delay of some sort to prevent bots from peppering the community with spam. I have removed as many as 152 spam posts on one community that turned the delay off. They were made within a 10 minute period. We do appreciate you heads up on the spam and I'll see what I can do to reduce your frustration. Thank you for letting me know! Location: The State of Southern NJ! 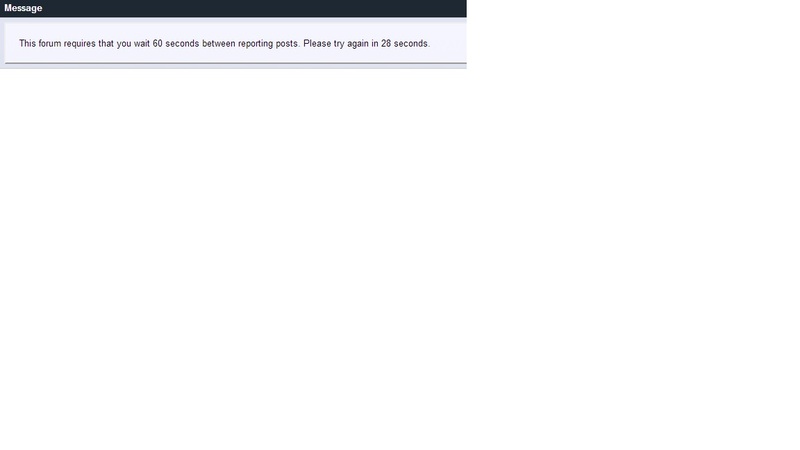 I recently reported two spammers and the wait was 60 seconds. Not a big deal since I usually read one or two other posts in between seeing and reporting the other annoying posts. I too have encountered the dreaded 60 second gap between posts, and it was also when reporting SPAM! LOL, "Wow you type fast!!!! Are you part Cheetah/Stenographer?" This is starting to happen again, A LOT! Whatever fix you put in last time would be appreciated. Thanks! Quick Reply: What is the purpose of this feature?